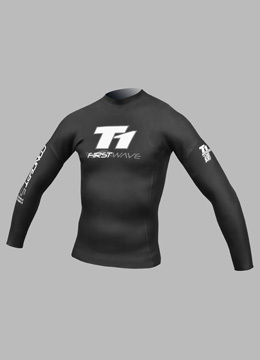 “The First Wave is simply the best wetsuit in the world and we challenge it against any other more expensive brands to the test. 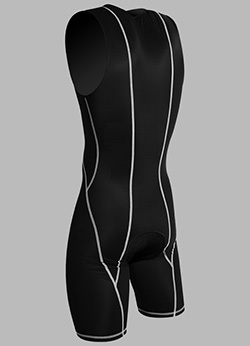 Our high-end suit is lined with 4-way stretch Nylon Lycra® to minimize chafing. All seams are glued and blind-stitched, making them stronger than the rubber itself. 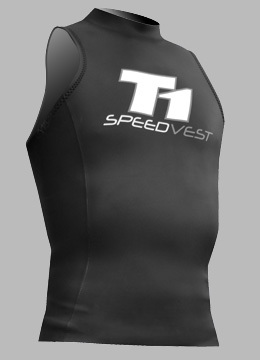 All wetsuit models feature sleek graphics and are sold as separates for a more customized fit. Flexible 2mm body and arms with a lower neckline. BIO-STROKE design puts your arms into a forward rotated shoulder position for a more efficient swim stroke. YKK® Custom Zipper is the smallest and lightest and makes removal easier than ever. GreenGoma™ #9 Rubber with Super Composite Skin makes the First Wave the warmest, fastest, most durable, flexible, and buoyant, and the most comfortable wetsuit in the world today. Lighter zipper weighs 30% less with same tensile strength and, lower neckline. 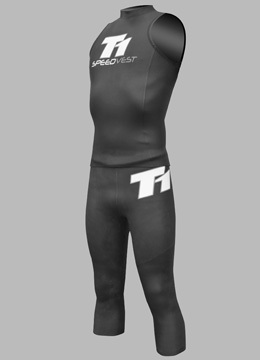 All T1 Wetsuits are made of GreenGoma™ a limestone rubber…bye-bye petroleum wetsuits. 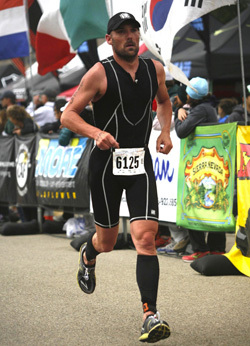 Until recently all triathlon wetsuits have been made of petroleum. First in the industry to introduce limestone rubber into our wetsuits, all T1 Wetsuits incorporate this amazing GreenGoma™ technology. GreenGoma™ rubber offers better stretch, buoyancy, durability, and insulation with a more closed-cell injected construction thus making it 98.9% water impermeable. So it is lighter, it dries quicker, and lasts longer. The only part of the rubber that gets wet is the new stretch liner that is now made of recycled post consumer products. 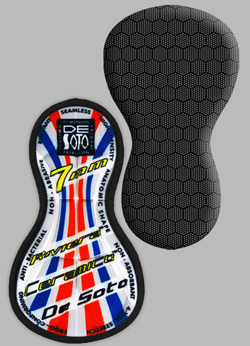 Both GreenGoma™ #8 and #9 are laminated at the Yamamoto factory with Yamamoto SCS Super Composite Skin. So is this rubber environmentally friendly? Is it a “green” wetsuit? We have seamlessly replaced one rubber with another that is better, more buoyant, helps you swim faster, and lasts longer. If nothing else were to change, you will have a better-performing product with less detriment to the environment, which is always our goal. Please allow us to be perfectly upfront. There are a handful of companies that are manufacturing wetsuits out of limestone rubber and then marketing them as environmentally-friendly. Currently, wetsuit rubber is either made of petroleum, which begins with oil exploration and drilling, or, in the alternative, made of limestone, which begins with mining. Both petroleum and limestone have taken hundreds of thousands of years to produce and both are nonrenewable resources; both are in limited supply on our earth, require heat, and create pollution and waste to refine into a finished product. So for one to claim that a limestone wetsuit is “green” is just not true, at least not yet. It is apparent in light of the recent oil spill in the Gulf of Mexico, that limestone is cleaner when one considers the risk of environmental disasters. The factory that makes our GreenGoma™ uses much less heat to refine it as compared to its petroleum counterpart. This is a step in the right direction. In order for us to step away from limestone in the future, we need to first step away from petroleum and look for other “greener” options. The idea of trying to create a green wetsuit has inspired us to change to recycled internal fabrics with no VOC (Volatile Organic Compounds) dyes. The use of non-toxic laminates and adhesives during the assembly process are additional steps in our goal. We are getting closer to finding water-based adhesives that are stronger and more flexible. 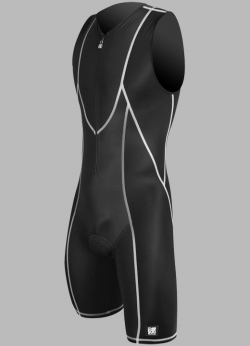 Finally we are working with YKK on developing a wetsuit zipper made of recycled materials. As for recyclability and sustainability, no wetsuit rubber in the world is recyclable. 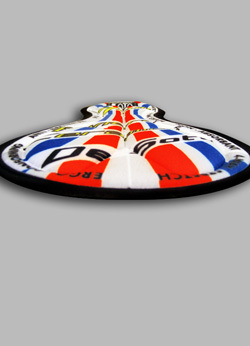 Yes, old triathlon wetsuits can and should be re-used for other sports, or can be cut up and used as potholders, used for insulation and even be turned into beer and soft drink koozies. For now, the most obvious form of sustainability is simply that we have created a wetsuit that will last longer, so you will not have to replace it as soon. Now doesn’t that just sound like this company has their act together? Thinking about using “Greener” materials as a replacement for petroleum based wetsuits is awesome! And the performance of the product is better than what it is replacing? Perfect! Sign me up! Oh yeah, and right now De Soto Sport 2012 models are all on sale! I think now you get the point! I don’t know how long the sale will be going on, so I would hurry and get your set today! 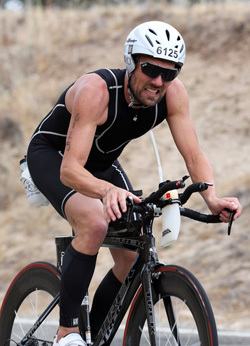 DeSoto also has two other lines that offer their wetsuits at a lower price point, the Black Pearl and the T1 Espresso are also good choices for someone just getting into triathlons who may not want to invest so much before jumping in the water for the first time!